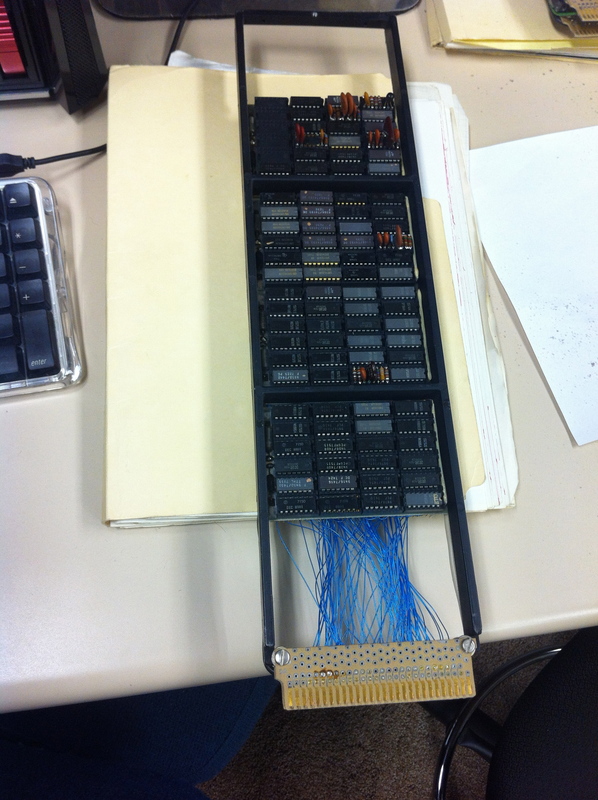 This is basically the 1974 version of a DIMM. It measures 16″ by 11.5″ and holds 16 kilobytes. 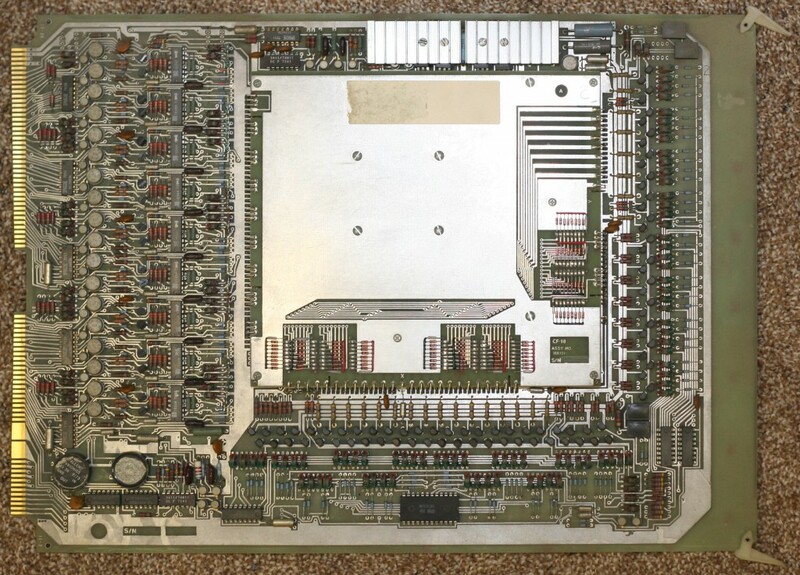 It’s technically 18 bits wide but only 16 were used in the PDP-11. The raised part in the middle is where the cores are actually stored. Each bit is a little ring with 3 wires running through the middle. By running current through the wires you could magnetize or demagnetize each ring. One interesting tidbit is that reading is destructive! When you read a bit you are actually demagnetizing the ring and the memory controller had to then do a write cycle to restore the bit. You can’t see the rings in the picture (I’m guessing they kept them covered because they were fragile), but you can see some nice pictures and a more in-depth explanation at the Wikipedia page. The cool thing about the module is that everything is discrete. There’s not a custom chip in sight. Along the bottom and right edges of the board you can see the row and column drivers. On the right you can see 18 instances of the sense amplifiers and inhibit drivers (1 for each bit in the word). This disk controller could support 2 10MB hard disks. The computer also has a floppy controller (for 8″ floppy drives) and a RS/232 controller card (3 ports). It’s funny that I grew up with this computer (and later a PDP-11/34 with 2 rack of equipment) but never cared about what kind of thought and work must have gone into it… I was always way more interested in my pirate Apple ][+ clone that I put together from a kit in second grade (if you’ve never used an Apple ][ before, try this emulator I recently wrote in HTML5). But now my dad decided to get the PDP back up and running so he’s been showing me all the little parts and I think I’m old enough now to appreciate it. The interesting thing for me about all this old technology was how amazingly straight forward 90% of it is. For instance, the front panel has a keyboard that shifts 3 bits at a time into a shift register and then lets you generate bus cycles (all driven by state machines in hardware). This was instead of the DEC’s computers which makes you enter binary with 16 individual switches–it’s a nice, simple addition that makes it way more pleasant to work with than the standard PDP-11 and it’s totally understandable. I think you mean “discrete” rather than “discreet”. This is way cool. Your dad sounds awesome. Awesome! I want your dad to be my uncle! Thanks for posting these pics. Amazing! i really don’t think people today realise how far we’ve come in such a short time. Terrific! 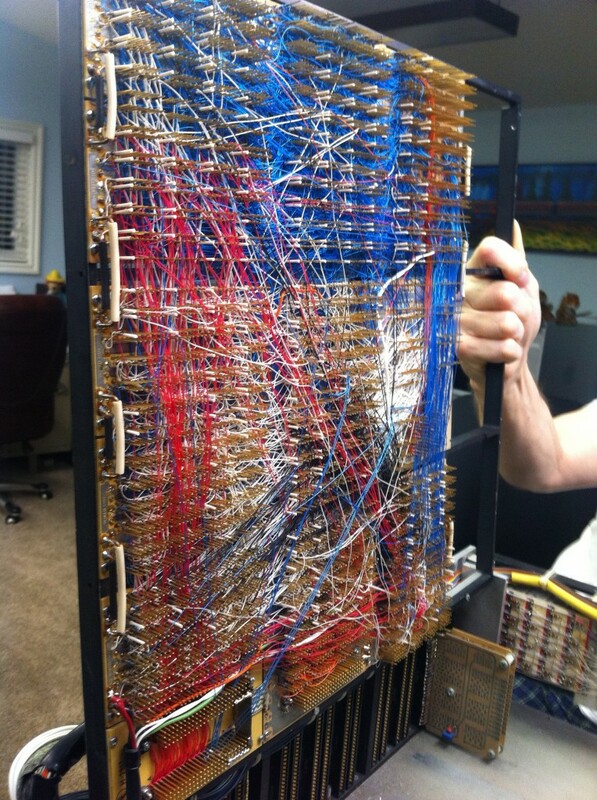 Your Dad creating his own PDP-11 from scratch – particularly via wirewrap – took a lot of good design and vast quantities of patience! Bringing it “back to life” sounds like a super father-son project!!! He designed and built a PDP-11 clone by himself? That’s amazingly cool. You see a lot of FPGA reimplementations of (particularly) DEC stuff, and I have a piece that used to live in a PDP-8 home-built in a wooden box from *cough* ‘relocated offsite’ boards by a DEC engineer, but it’s quite spectacular to see someone go to the effort of actually recreating a system at the component level. Mega kudos to your dad. Your guess that core memory was protected since fragile is correct, but not the only reason. The fragility was acceptable, I’ve travelled large distances with core memory in my car and upon arrival all the data would still be there. People were the problem, especially types who wanted to clean core memory with compressed air. The protection also helped to keep a constant temperature, core memory being very temperature sensitive. The very early core memory even required good programming to avoid reading the same memory location too often (in a loop). The cores being read and rewritten would heat up and lose the data. That is why core memory would always have a parity bit ( and parity bit error light) to indicate such errors. Awesome job to build this thing from various components! DEC as well as the russians who copied it worked with large teams. Awesome! I would love it if you could grab a higher quality photograph of the wire wrapping! 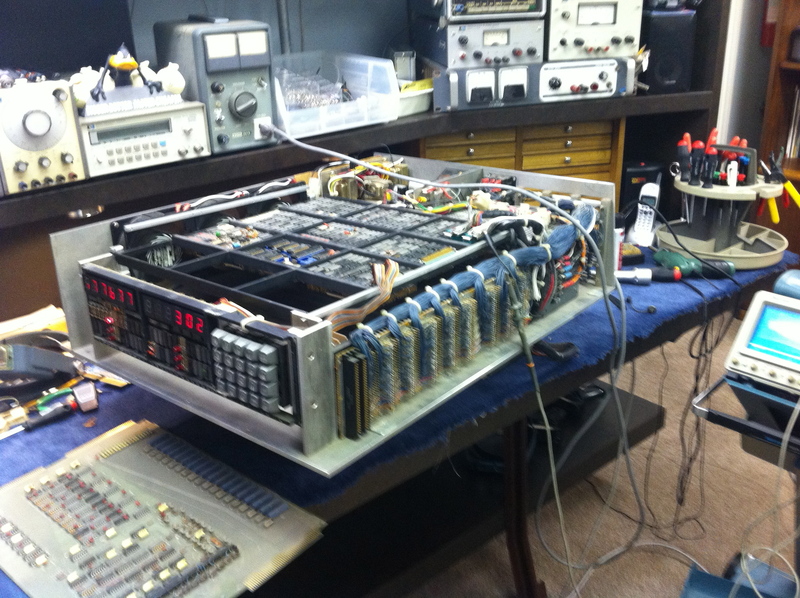 Two things: would love to know more about Why, When, and How your dad built his own PDP-11! There has got to be a story there. Maybe you could either interview him and make a series of posts on it, or have him write some guest posts? Second, if he wants to have it preserved, check with the computer history museum (computerhistory.org); they have a lot of DEC computers and parts and some homebrew machines already, but might well want this one. I would love to do a series on it. It’s just a question of time. I tried to get him to write it up but he seemed completely uninterested. “No one want to read about this old stuff” was the basic attitude. I really wrote this blog post as a kind of proof that other people would find his insights interesting… I’ll let him know people are still reading and that he should really think about writing something more :-). Your dad is beyond awesome. He should know how awe inspiring and incredibly mind-bending his amazing work is. I draw inspiration from the men of his generation that did incredible things and conquered achievements of this magnitude. I am truly in awe. He deserves awards and recognition for this work. Wow, this is truly heroic. If you haven’t done it yet, I highly recommend a family trip with your dad to the Computer History Museum in Mountain View. A few months ago I went with my kids, my electrical engineer dad, and a visiting geek nephew. Everyone was totally engrossed, and it seems especially meaningful to be there with someone who remembers working with the technologies on display. And in your dad’s case, they might have a project for him. Very cool project. When did he put this together? I would love to read more about the project and the story behind it. I’d love to read about your father’s experience building a PDP clone! I’m taking a little trip to the past running a Unix V7 x86 port (http://www.nordier.com/v7x86/index.html) this weekend. It would be great if you could get your Dad to do a wright up on how he built the pdp 11/05, I am working on building a pdp8 straght 8, so no chips in the cpu! it is great to see others building there own computers from scratch!